Debra Harry has been sewing since the age of nine when her paternal grandmother sent her downtown on the bus to the local sewing store for sewing lessons. She has never stopped creating with fabric since then. 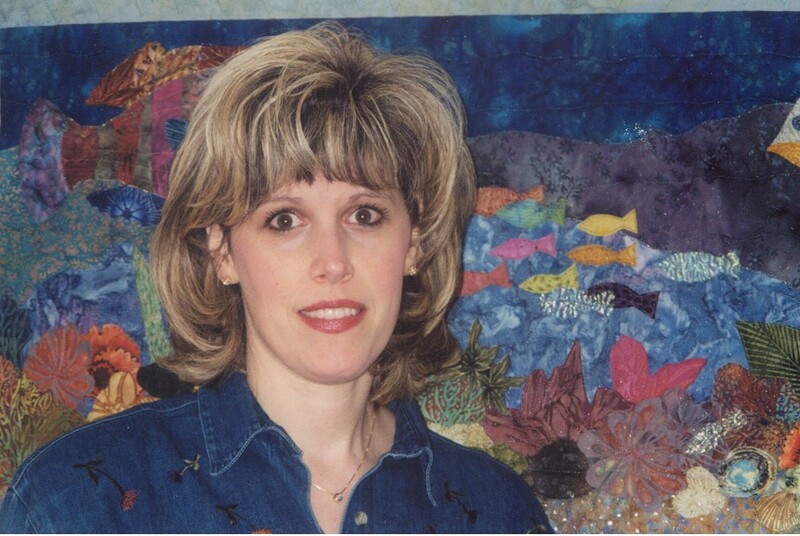 Even prior to those early sewing lessons, Debra was always creating and working with her hands as a child. Her early sewing projects were mainly clothing. She earned her degree in art with a concentration in printmaking. It was an easy and natural transisition for Debra to blend her love of fabric and knowledge of sewing with her art background to begin quilting in 1985. She is a self-taught quilter and her early quilts, as with many quilters, were very traditional. Mostly bed quilts and wallhangings in traditional block settings and colors. This evenually developed into pictorial quilts and further to the art quilts she produces today. Her award-winning quilts have been exhibited in shows across the country. 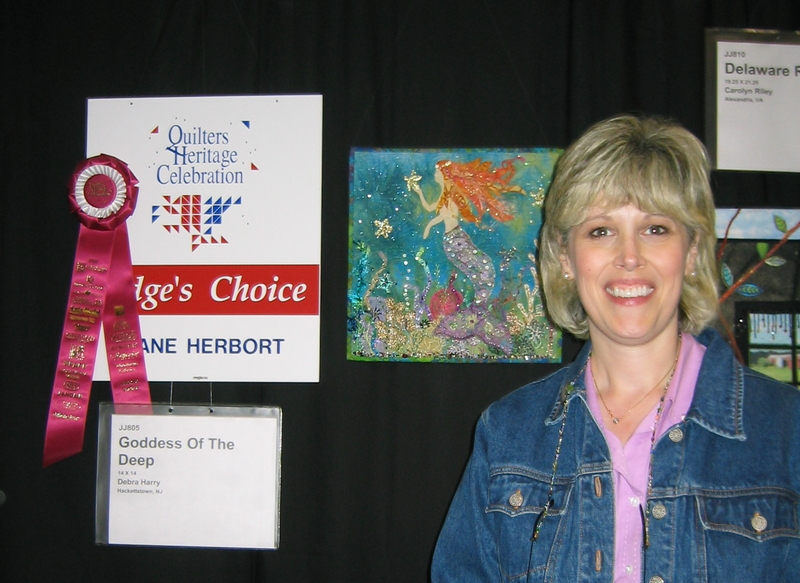 She has won many awards for her work, including the Curators Award in the Hoffman Challenge and Judge's Choice at the Quilter's Heritage Celebration. She has done commission work for nationally known fabric manufacturers and private collectors. In addition to her quilts, Debra has designed a line of patterns that have been carried by several quilting catalog companies. Debra's work reflects her love of color. Recent works have included underwater scenes and a series on mermaids. Always interested and trying new techniques, you can see many of these influences in her design style. Her work incorporates batiks, batik lames, hand-dyed ribbon, glass beading, silk embroidery embellishments, fibers, specialty metallic and rayon threads, and Angelina fibers. Debra lives in Northern New Jersey with her husband and their two cats. The cats are always interested in thread, beads and helping to make fabric selections. I am an artist who loves color. Quilting has been a natural combination of my love of fabric and my art background. My quilting style has grown to not only include rich colors but also fibers, various embellishments and beading. The subject matter usually is centered around nature and particularly the my love of the ocean. My ocean themes explore the beauty of underwater sealife to the enchanting world of mermaids and seahorses. 2005 - Quilting Arts Magazine 2006 calendar contest. "Let's Go To The Beach!" 2004 - Quilting Arts Magazine 2005 calendar contest. "Goddess of the Deep" featured quilt for the month of June. 2001 - Hoffman Challenge - "Hoffman's Fish" accepted into traveling exhibit that will be shown at quilt shows and shops across the country for one year. Awarded the Curator's Award. 2001 - Pocono Mountain Quilt Show - "Dragonflies" - Judge's Choice award. 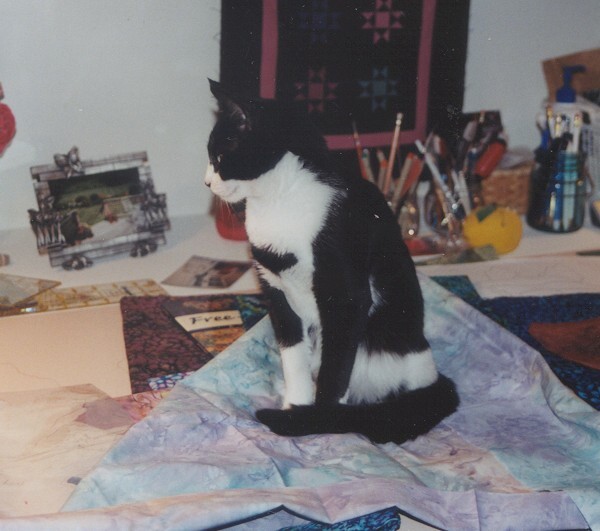 Quilting Today - June 2002. "Family Album"